Frisky Otter Tours | "An experience like no otter"
Frisky Otter Tours – An Incomparable Adirondack Experience! 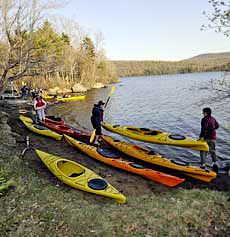 Don’t Miss The Otter Paddlesports Demo, May 18-20, 2018! Check out our Boats and Accessories page for tips on buying the right kayak for YOU! We are located in New York’s Adirondack Park, at the historic Woods Inn in Inlet, NY with shoreline access to Fourth Lake, renowned for its spectacular views and sunsets. For directions and contact information, click on the “Contact Us” link on the left. To learn more about Connie Perry and Frisky Otter Tours, click on “About Us”. Morning and Sunset Tours depart directly from our waterfront location. Afternoon and Full-Day Trips depart from our storefront by van to explore the region’s many pristine waterways. Paddlers of all skill levels are welcome!